Every year, about 70 people are killed and 2,500 seriously injured as a result of accidents involving vehicles in and around workplaces. 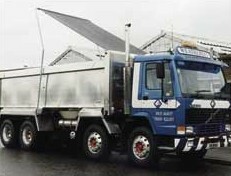 44% of falls from tipper lorries occur during sheeting and unsheeting. Many tipper sheeting accidents could be prevented if automated sheeting devices were used and there was better co-operation between the parties involved. to comply with authorisations issued under the Environmental Act 1990.
high winds creating a sail-effect of the sheeting. 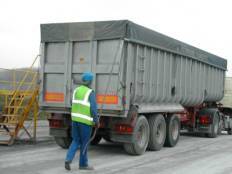 Companies operating tipper vehicles should take all reasonably practicable steps to prevent falls during the vehicles' operation. People in control of sites where tippers operate should make sure adequate steps have been taken to prevent falls during tipper sheeting and unsheeting. Under the Management of Health and Safety at Work Regulations, you need to assess risks and reduce them 'so far is reasonably practicable'. What is considered reasonably practicable will vary depending upon the circumstances but if an accident occurs at a particular site then it will be for all parties to show that all reasonable steps were taken to prevent the accident. In addition to the use of sheeting aids etc. you may have to show you took reasonable steps to co-operate with other companies or people to prevent falls. This is particularly important with respect to tipper lorries where a tipper operator picks up a load from one site and delivers and unloads at a second site. There are also legal duties placed on employers by the Workplace (Health, Safety and Welfare) Regulations; these are more specific for reducing risks from falls. propose ways for removing or reducing these risks. Does the driver need to access the top of the vehicle? Does the driver need to use a ladder or steps to access the top of the vehicle? Does the driver need to get onto the load? Has the material been loaded unevenly requiring trimming? Has too much material been loaded that will have to be removed manually? What is the condition of the ground when sheeting is carried out? Where are the operations carried out in relation to other traffic and pedestrians? All of these hazards can present the risk of a fall from either the side of the vehicle or the top edge leading to serious injury or death. There are a selection of solutions but some options are better than others. It is sometimes useful to think of the solutions as being in a hierarchy with a method of sheeting and unsheeting that does not involve getting onto the vehicle or even touching the sheet as the first choice. 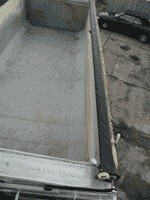 Use gantry/harness systems to prevent or arrest a fall. This may be possible if the load will not blow off in transit and does not produce dust and the load does not need to stay dry. This is at the top of the hierarchy because these systems can allow the driver to sheet the load from ground level. These systems also remove or reduce the risks from manual handling. They are readily available from many manufacturers. They may vary in design but can be adapted to fit most vehicle body types. There can also be financial savings from automated sheeting systems, because they reduce vehicle turn-around times. 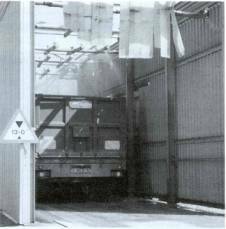 It is important to remember that automated sheeting systems do not only protect the driver while sheeting up at the pick-up point but also when unsheeting at other sites. Powered systems are preferable to manually operated mechanical systems. Because the driver does not need to use any physical strength to operate powered systems, manual handling risks are reduced. Power systems also allow the driver to operate away from the vehicle. The load is sprayed with a solution of a synthetic polymer in water. This forms an instant skin across the load surface preventing material from being blown off during transit. Spraying can be done at the weighbridge after weighing. The solution is delivered via lateral bars; the number of these depends on vehicle length (Figure 7). Although this method avoids the driver needing to access the vehicle load and is as effective as conventional sheeting in preventing damage to the environment, it can not be used for certain loads, e.g. coated stone or quick lime. 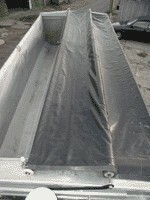 The polymer sheet can not be reused so load must be sprayed each time. Manual sheeting from the vehicle is to be discouraged unless it is not reasonably practicable to use automated sheeting systems or sheet from the ground. Loads can be sheeted from platforms removing the need to climb onto the vehicle or the load. In a limited number of situations automatic sheeting systems will not be fitted and suitable gantry arrangements may not be available. In these circumstances containers must be placed on the ground for sheeting and un-sheeting. The driver must perform these tasks from the ground. In order to minimise the risk of manual handling injuries, the task of sheeting and unsheeting is best performed by two operatives. However, on driver-only collections this will not be possible and the operative may have to use a long pole with a hook. This is likely to result in a change in the operative’s centre of gravity and a resultant increase in the load on certain on parts of their body. For this reason it is important to choose the correct size of container and ensure operatives have received appropriate training in manual handling techniques. For large containers, where full access from ground level may not be possible, or where excessive stretching or twisting by the operator is required, platforms or secure steps with handrails should be provided. Under no circumstances should anyone be allowed to stand or walk on the load and operatives should be aware of the procedure in the event of automatic sheeting systems not working. These platforms should be fully enclosed by guardrails on all sides to reduce the risk of a worker falling between the platform and the side of the vehicle or stepping off the end of the platform. If the worker needs to leave the platform to carry out further tasks associated with sheeting, then overhead gantries and harness systems should be used. If platforms are provided there should be enough of them for the throughput of vehicles; they should be easily accessed and management systems, e.g. supervision, should be in place to ensure that the platforms are used properly. There are disadvantages to using platforms: it is not possible to match the variations in size, height and length of all vehicle bodies. 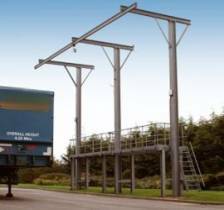 In such circumstances the use of overhead gantries and harnesses may be necessary. This system of sheeting involves the use of a specially designed access platform and overhead beam or gantry. An integral full-body safety harness and inertia reel is used in conjunction with the overhead beam and will protect the driver whilst he is on the vehicle sheeting (Figure 10). For manual sheeting with a harness system the sheet should already be suitably folded in a position to the front of the vehicle body on a sheet rack or purpose-built shelf or on carrier hooks. Sheets will need to be long enough to be tied to the base of the vehicle body and be of sufficient weight to resist being blown in the wind. The driver should walk down the centre of the load rolling out the folded top sheet while facing the rear of the vehicle body. When half way along the load, but not closer than two metres from the rear of the vehicle, the driver should turn round and pull the sheet tight. It is important that the sheet is not pulled at any other time. The driver should turn round and while facing the rear of the vehicle throw the remainder of the sheet and ties over the tail-gate. While standing in the centre of the load the driver should open out the sheet, throwing the sheet and ties over the sides of the body. 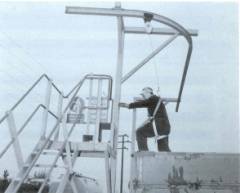 The driver should then return to the front of the body walking forwards along the centre of the load and return to the ground using the ladder and handles provided. If there are no fall precautions in place at the site then the material should not be loaded and the driver should turn back. This also applies for delivery of loads where there are no precautions available for unsheeting. Passing traffic and pedestrians should be excluded from the area. The sheeting area should be the last area the driver uses on site. This is particularly important where the load may need adjustment after weighing but prior to leaving the site. Train and instruct staff on the safe systems of work (and provide refresher training where necessary) for using the automated sheeting, manual sheeting, platforms and PPE. 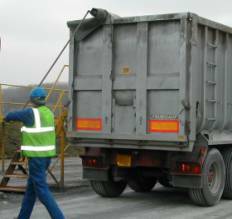 Supervise and monitor tipper sheeting and unsheeting. Repair of equipment. Provision should be made for those who carry out repairs. They may HAVE to get onto the tipper body to carry out maintenance/repair work. Wherever possible, the need for people to climb on top of vehicles should be avoided. Regardless of the type of sheeting equipment fitted or used, safe access should always be provided into and out of the body of the lorry. Using well designed and sited fixed ladders and handholds can improve access. Do not jump down from the vehicle as landing awkwardly can lead to broken ankles. Access on to vehicles should be restricted to those people permitted to do so, e.g. a well supervised and monitored safe system of work for maintenance workers. Nobody should attempt to gain access whilst a vehicle is in motion; this is a significant cause of accidents each year. While every effort has been made to ensure the accuracy of the references listed here, their future availability can not be guaranteed.